And forgive us our debts, as we forgive our debtors (Matthew 6:12). 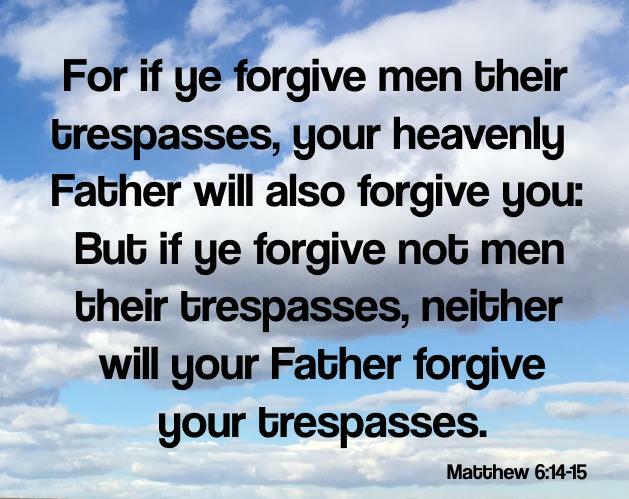 For if ye forgive men their trespasses, your heavenly Father will also forgive you: But if ye forgive not men their trespasses, neither will your Father forgive your trespasses (Matthew 6:14-15). So even though are sins were forgiven when we were born again, He made it very clear that no matter how long we have been saved, He still requires us to forgive others of their trespasses (debt, sins) if He is to forgive us of our trespasses. Having said that though, the "but" in the scripture means that forgiveness of others is a choice. Problem is that it is a heaven or hell choice! Yes, once saved does not mean you are always saved. Go here to review that lesson. I say not unto thee, Until seven times: but, Until seventy times seven (Matthew 18:22). So likewise shall my heavenly Father do also unto you, if ye from your hearts forgive not every one his brother their trespasses (Matthew 18:35). Like Jesus said, to forgive a person must be from our hearts, meaning just not out of our mouths, otherwise we will be thrown to the torment of hell. Is there anybody we have not forgiven? If so let's make a point to repent and to forgive that person. If we still can't we need to go to the throne room and ask Jesus to help us to change our heart, giving us a forgiving spirit.